Danny McNichol was one of the greatest athletes in the history of the University of Pennsylvania. He lettered in baseball, basketball and football and captained both the baseball and basketball teams. 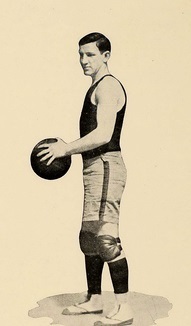 McNichol was a three-time Helms Foundation Basketball All-American, being chosen in 1919, 1920 and 1921. Like many college-educated basketball stars of his era, McNichol showed limited interest in the rough and tumble professional game. He did join Tri-Council in the Philadelphia Basketball League late in 1921-22 and played well in 11 games. The following season, in what would be his only full season in professional basketball, he led Tri-Council to the PBL championship series, where they lost lost to the Philadelphia SPHAS. Throughout the 1920’s, McNichol served as assistant coach for his brother, Ed McNichol, who was the head men’s basketball coach for the University of Pennsylvania from 1920 until 1930. Daniel Joseph McNichol Born: Oct 12, 1898 Died: May, 1963 Hometown: Philadelphia, Pa.